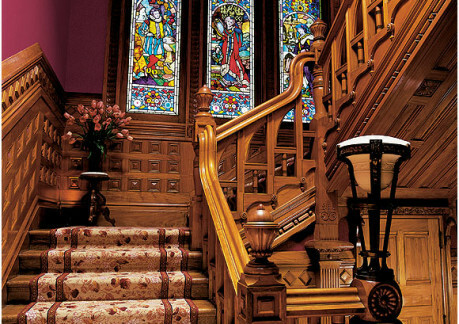 The 1884 Carson Mansion may well be the ultimate Victorian. As one of the most written about, and photographed Victorian houses in California, and perhaps in the United States, the William Carson Mansion epitomizes the range of possibilities for eclectic design expression that created a peculiarly American style of architecture. 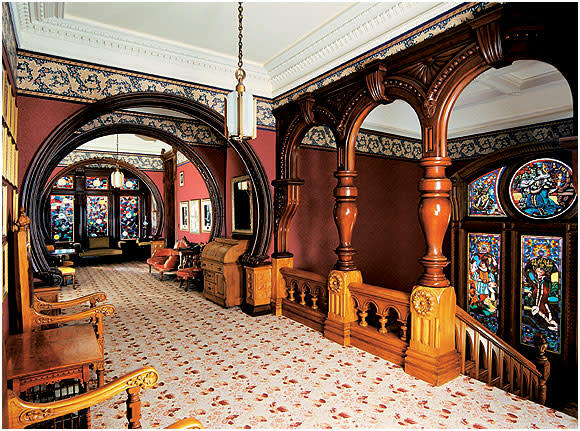 Built by lumber magnate William Carson to keep 100 of his workers employed during a slump in the timber industry, the mansion’s towers and turrets, columned porches, multiple gables and ornate gingerbread detail—not to mention the paint job—evoke everyone’s ideal of how a Victorian should look. Carson asked the Newsom Brothers, respected San Francisco architects, to design a family home that reflected his business success and social stature. The Newsoms responded with an exuberant design that combined many of the current styles including Italianate, Eastlake, Stick and Queen Anne. 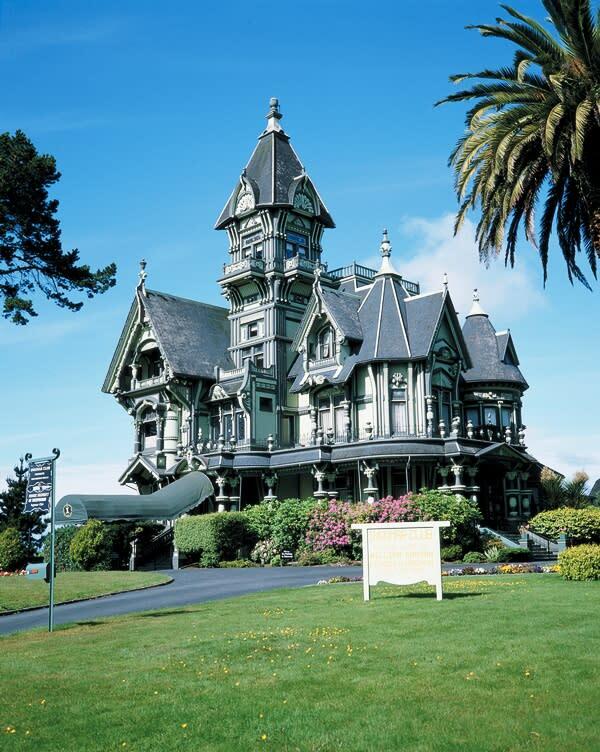 The mansion that arose on a bluff overlooking Carson’s lumber mills and docks became the pride of the city, and set the trend for a period of highly ornate architecture in Eureka. 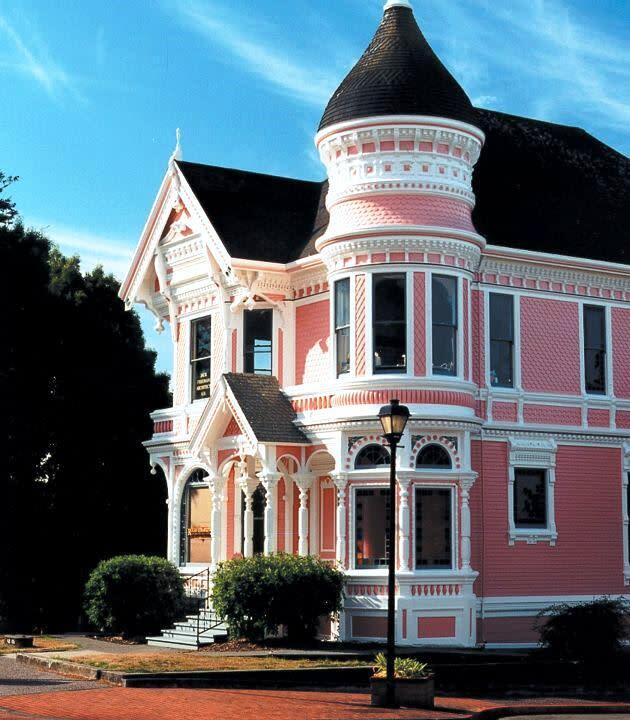 The Newsoms also designed the J. Milton Carson House, locally known as The Pink Lady, which William Carson built across the street in 1889 as a wedding gift for his son. Prominently sited, the extensive grounds provide a substantial pedestal for this sculptured edifice. Eye-seeking and shadow-producing surfaces showcase the use of wood as a building material. This three-dimensional "pattern-book" took over one hundred men over two years to construct. Its influence on the design of subsequent buildings in Eureka is readily apparent even today. In addition to the abundant use of redwood, Mr. Carson imported 97,000 feet of primavera or "white mahogany" from Central America, along with other woods and onyx from the Philippines, East India, and Mexico. 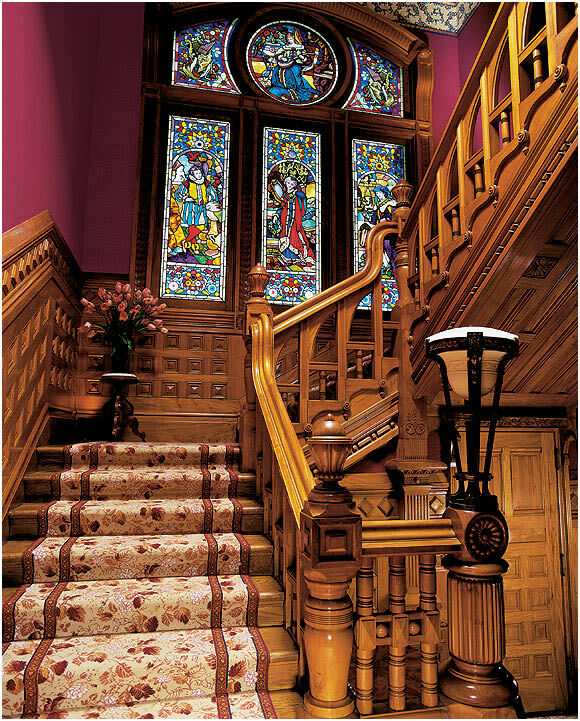 The elaborate interiors include stained glass, plasterwork, and carved ornaments in exotic woods. The Carson Mansion was owned by the descendents of William Carson until 1950, when it was sold to the Ingomar Club. The Mansion is privately owned and maintained and is not available for public entry. The private club exists primarily to restore and maintain this incredible architectural gem. However, visitors are welcome to view the mansion and take photos from the sidewalk. Go to website for more information on the Mansion and the Ingomar Club, site has a great photo gallery Located at 143 M Street, Eureka (at intersection of 2nd Street). A private club owns the building, and there are no tours of the interior.